The breadth of action of convulsive therapy is unique among modern psychiatric treatments. It was introduced as a treatment for dementia praecox, but within a few years it was further recognized as a means to relieve depression and mania, delusional states, and catatonia. 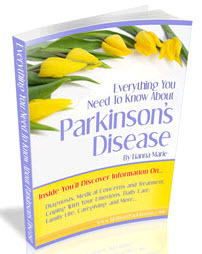 Furthermore, its use in those suffering from the neuroleptic malignant syndrome and parkinsonian rigidity has recently been acknowledged. ECT should be considered when the onset of an emotional disorder is acute, when changes in mood, thought, and motor activities are pronounced, when the cause of the disorder is believed to be biochemical or physiological, when the condition interferes with the patient's daily life, or when other treatments have failed. It is effective in treating the psychotic patient and the patient with a disorder of mood, either mania or depression, regardless of the cause or severity. Those who have delusional depression, who are guilt-ridden or feel worthless, who believe others control their lives and influence their minds and behaviour, who unreasonably suspect their partners of being unfaithful, or who are so racked by mental pain that they contemplate suicide, respond positively, and in relatively short order. Patients with mania, with or without psychosis, are also excellent candidates, as are those with manic delirium and rapid cycling states. Among patients with schizophrenia, those with a predominance of positive signs are best treated with the combination of a neuroleptic medication and ECT. Those who have deteriorated after prolonged illness to a predominance of negative signs do not respond well to ECT. Less well known is the effectiveness of ECT in treating movement disorders. It can relieve the excitement and restlessness of the manic, the mutism, motor rigidity, and stupor of the catatonic, the hand-wringing of the elderly depressed, and the rigidity of parkinsonism, no matter what psychiatric classification has been assigned to the illness. 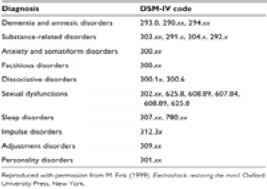 Many illnesses classified in DSM-IV respond to ECT (Table 1). The efficacy of ECT for the range of disorders listed here is particularly impressive when we consider that it is frequently the last resort, applied after other treatments have failed and after patients have suffered from their disorders for months, even years. ECT is not considered useful for a patient with a neurosis, situational maladjustment, personality disorder, or drug dependence. It is of limited benefit for anyone with a lifelong history of mental and emotional dysfunction, unless the onset was acute and well-defined or unless there are prominent affective or psychotic features. If such a patient evinces suicidal impulses, ECT should be weighed as treatment. 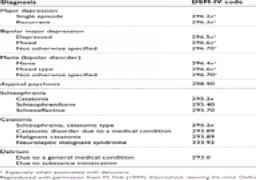 The principal psychiatric illnesses for which ECT is not recommended are listed in Table 2.